The Welsh language commissioner has accused the UK government of weakening Welsh language services on its main website gov.uk. Meri Huws said that Welsh language provision on the site had "deteriorated astonishingly" since its 2012 launch. She said that the issue was a "major concern" and that she had raised the matter with UK ministers. The Wales Office said it was working with other UK government departments to ensure that Welsh services improved. Ms Huws told the assembly's Culture, Welsh Language and Communications committee: "Services provided by UK government have weakened over this past period and that is a major cause of concern for me. "I have contacted the Wales Office and raised it with ministers in Westminster too and the main reason is the introduction of gov.uk, which means that provision that was once strong from agencies such as the Department of Work and Pensions (DWP) has deteriorated astonishingly," Ms Huws said. "We haven't seen a slowdown, we have seen a galloping backwards in terms of provision from Westminster and in seeing the figures that did cause me major concern and we will be following that up." "Over the past year I have seen agencies of the Westminster government approaching us complaining about the Cabinet Office and gov.uk and saying that it is now hampering their work and they are concerned that the strong bilingual services that they have put in place have been hampered by gov.uk," she added. 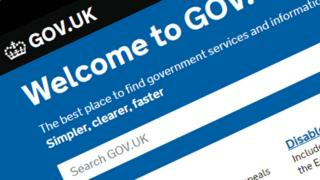 The website gov.uk was intended to create a single domain for government. Responding to the criticism, a Wales Office spokesperson said: "The UK government is committed to the Welsh language. "The Wales Office notes the Welsh language commissioner's concerns and is working with other government departments to ensure that provision is improved." A Wales Office spokeswoman said: "The UK government is committed to the Welsh language, the Wales Office notes the Welsh Language Commissioners concerns and is working with other government departments to ensure that provision is improved."